The seller lists an upgraded Sony Xplod stereo but will include the stock unit with the vehicle. Among the recent repairs to it are: water pump, clutch, rear main seals, plugs & wires, exhaust manifold gasket, and valve cover gasket. Seller does state that the windshield is cracked. The bodywork in 1984 was specific to the Indy Fiero, but was widely introduced starting in 1985 on the Fiero GT. Of the Indy Fieros made, roughly 250 of them came with the 4-speed option - making this already-rare car even more so. The Fiero has a reputation of being underpowered, but it also handles quite well and during its production run the only vehicle to outscore it in NHTSA testing was the Volvo 740 DL wagon. 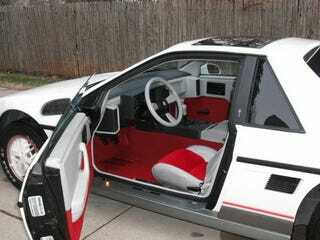 The seller of this Fiero is asking $4500. Does that price make you want to take a victory lap, or would you rather head into the pits? Weigh in in the comments below! Original ad can be found here.